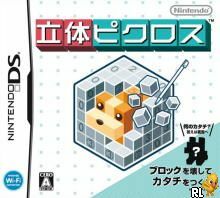 Gameplay follows traditional Picross rules, where players use logic to mark each square as full or empty, eventually revealing an unknown picture. 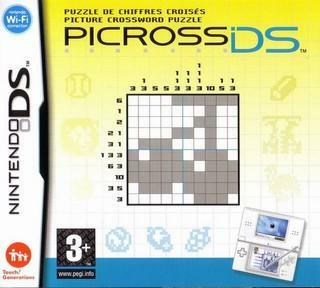 Additional modes allow players to create their own puzzles and send them to friends, download classic puzzles and compete in speed competitions with friends or random rivals via the Nintendo Wi-FI Connection, download classic Picross puzzles from previous titles and complete up to five timed daily challenges. In all modes except Daily and Online Challenge, the player is given the opportunity to receive a "hint" which reveals one randomly selected row and column, which does not impact the player's time. Also, three types of background music can be selected (except for Classic puzzles and the unlockable level 11 "extra" puzzles), or the music can be turned off. Now you can add videos, screenshots, or other images (cover scans, disc scans, etc.) 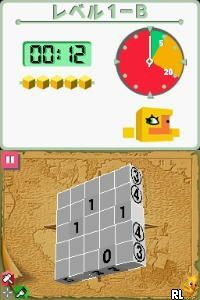 for Rittai Picross (JP)(Caravan) to Emuparadise. Do it now! If you haven't noticed yet, we have a retro game of the day feature (top-right of the screen) wherein we feature a new retro title every single day! Now, you can vote for your favorite games and allow them to have their moment of glory. Click on the button below to nominate Rittai Picross (JP)(Caravan) for Retro Game of the Day.